1. Blogging every day is hard work. #Write31Days gave me a new appreciation for the dedicated bloggers we all know and love who have something new on their blog every single day. It’s hard work. It requires a lot of time and dedication. It’s not for the faint of heart. 2. Writing every day becomes habit. There’s something about sitting down to write each day that keeps the words coming. And on the days they don’t come, you just keep waiting or writing something else until they do. Consistent creativity keeps your mind creating continually. 3. Commitment is the only thing that makes writers keep showing up. Linking up with #Write31Days showed me the power of commitment. 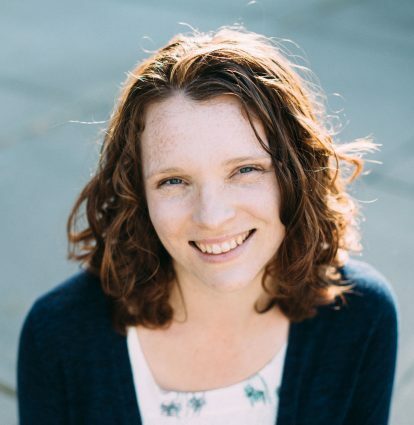 Once I left the ad network that required me to write several posts per week, I no longer had anyone keeping me accountable–and my blogging schedule fell by the wayside. There’s nothing like the accountability of a public commitment to keep you on task, to bring you back to the computer when you’re tired or would rather do anything else. Whether it’s a book contract or a link-up, taking the plunge and making the commitment is what will keep you going until you’re done. 4. Working with themes and in batches saves time. I knew I worked better when I could do one thing over and over in batches, rather than multi-tasking and changing gears constantly. But #Write31Days shows me the power of batch blogging on a whole new level. I outlined my series and hammered out the rough drafts before October came. Then I spent offline time editing and refining the posts. With my content edited and ready to go, I could add links, create images, and schedule in bulk when I was online. My friend Trina hand-crafted my series logo and then created a few pinnable images in PicMonkey to help me define the look. Once she’d given me a few templates to follow, I was able to take it from there. It made image creation so easy to know which fonts and colors I could choose from, which font to use for my keywords, etc. And with PicMonkey open, I could create multiple images in quick succession by a few changes to the words and layout. 5. Creating before you consume leaves little time for consumption. Very few #Write31Days series were written with Facebook and Twitter an Pinterest all open in other tabs. Tsh Oxenreider’s concept of “create before you consume” is a must when you’re putting all your effort into a big series. Consequently, one of the hardest parts about writing for #Write31Days is that it doesn’t leave you time to read very many other #Write31Days posts. And if you’re having a hard time keeping up with the series you want to read (let alone the one you’re writing! ), your readers are probably in a similar predicament. 6. Plan and prepare for big series in advance so that you have time to promote it. When you’re busy cranking out stellar content, you’re not going to have much time left to promote that content. 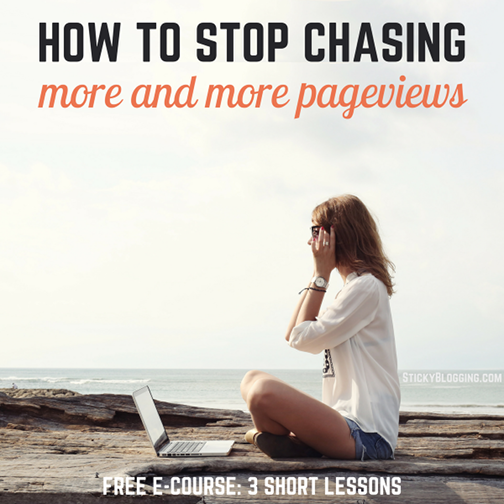 Create blog posts that share themselves. Hire a virtual assistant. Or plan ahead so you can promote your series while it’s still going (Buffer your Tweets, schedule your Facebook posts, make yourself a Pinning schedule). But keep in mind that post popularity may build slowly. No one is a best-seller in a day. #31Days posts may not go viral in October. But that landing page might be the most popular one on your site next March. If you invest your time and energy into an evergreen topic, your work will have dividends far beyond the month your post goes live. 7. Writers and readers need variance in topics. After 31 days talking about one thing, everyone is ready for a break. Regardless of the subject. Hard topics take more time to process and write than #Write31Days allows for. My friends who dealt with difficult and depressing themes found it draining to spend so much time on their series. 8. Don’t plan a topic that requires you to do more than just write about it. My friend Rachel did #31Days of Pinterest Applied. Not only did she have to write 31 posts, but she first had to document the process of completing the pins. 9. Constant brainstorming about one topic breeds creativity for others. When you’re constantly brainstorming about a topic you love, idea-forming will become habit. You just might find yourself coming up with more ideas than you need! And when you get tired of brainstorming about your chosen topic, you’ll find yourself engaging in productive procrastination as you jot down ideas for future posts and series rather than actually finishing your current series. 10. Writing is a team sport. 11. Rules are made to be broken. It’s okay to stretch your series into November. My friend Kateri is still working on her 31 Days series about living gracefully with chronic fatigue. What better way to exemplify gracefully pacing yourself than to stretch a one-month series out beyond the “norm.” There are other series that I was really looking forward to following that only had a post or two–I hope their authors don’t quit just because October is over. 12. NaNoWriMo might be easier than #Write31Days. I said that #Write31Days was the NaNoWriMo for bloggers. But pounding out a rough draft of 1,500 words a day in November sounds easy compared to writing, editing, formatting, and publishing a post every day in October. Except for the fact that I can’t write a line of fiction. 13. #Write31Days makes an eBook seem doable. Whether #Write31Days shows you how easy it is to write enough words for an eBook, or gives you the bulk of the content you need to get started, #Write31Days is great practice for more. 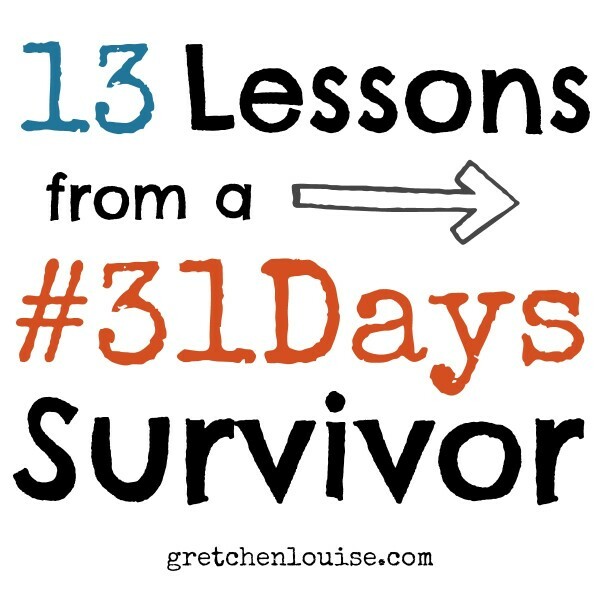 Click to Tweet: I’m a #Write31Days survivor! Click to Tweet: What did you learn from blogging for #Write31Days? Thanks for this post! Great thoughts. Thank you! 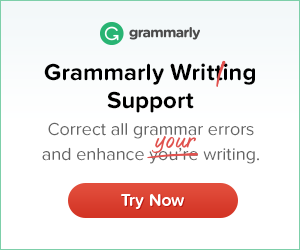 And kudos to you since you’re currently doing NaNoWriMo, I think! Yes, I don’t know how you did it! The research for my series took a long time (and taught me a lot!) but I didn’t have to create an entire site every day and document it with pictures. Love this! I learned that planning is the key! Yes! And you did a great job. Loved your graphics.